A fully-owned subsidiary of the UJA-Federation has sent $5,836,856 to the New Israel Fund since 2002, according to IRS form 990 filings examined by JCCWatch, with donations of between $258,503 and $802,096, made each year for the past dozen years. The revelation contradicts the public statements from the UJA-Federation chair Alisa Doctoroff, past CEO John Ruskay and current CEO Eric Goldstein who have misled New Yorkers to believe that the umbrella charity has no financial connection to the New Israel Fund. The New Israel Fund, in turn, is the financial banker for a network of organizations that demonize the Israeli government and the Israel Defense Forces, promote boycotts of Israeli products and call for international criminal proceedings against our very own Jewish state. The findings come on the back of a JCCWatch investigation on Tuesday that showed that UJA-Federation leadership have been pressuring former Israeli diplomats, and the office of the current Consul-General in New York, to give cover for their support of the New Israel Fund to participate in this weekend’s Israel Day Parade. In 2014, the UJA-Federation reported on the IRS form 990 that it had assets of $1.382 billion, generating $76 million in investment income, in addition to the $167 million in new donations it received from the Jewish community. 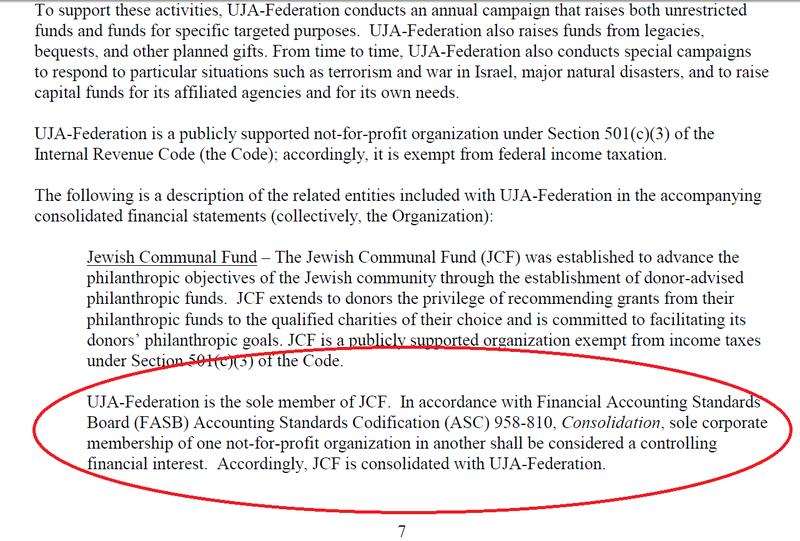 Buried on page 7 of its audited financial statements, under “Additional Notes,” the UJA-Federation listed an entity called the Jewish Communal Fund, of which it is the “sole member” and has “controlling financial interest,” meaning the UJA-Federation owns the Jewish Communal Fund, lock, stock, and barrel. 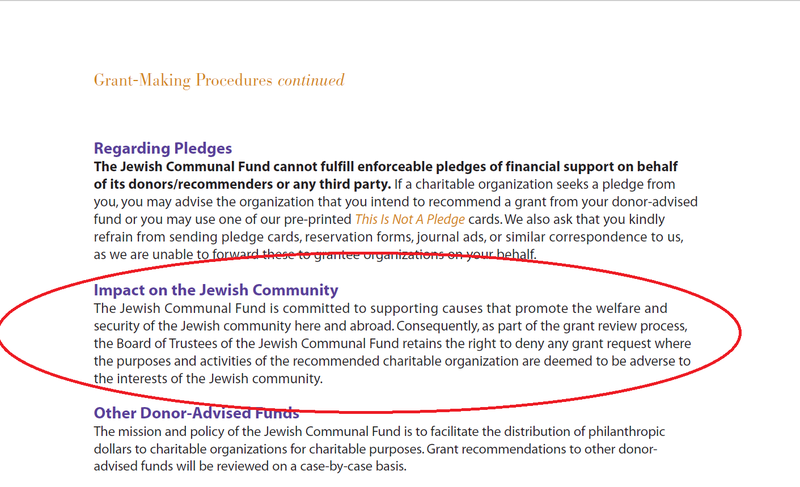 Grant-making guidelines of UJA-Federation’s Jewish Communal Fund. 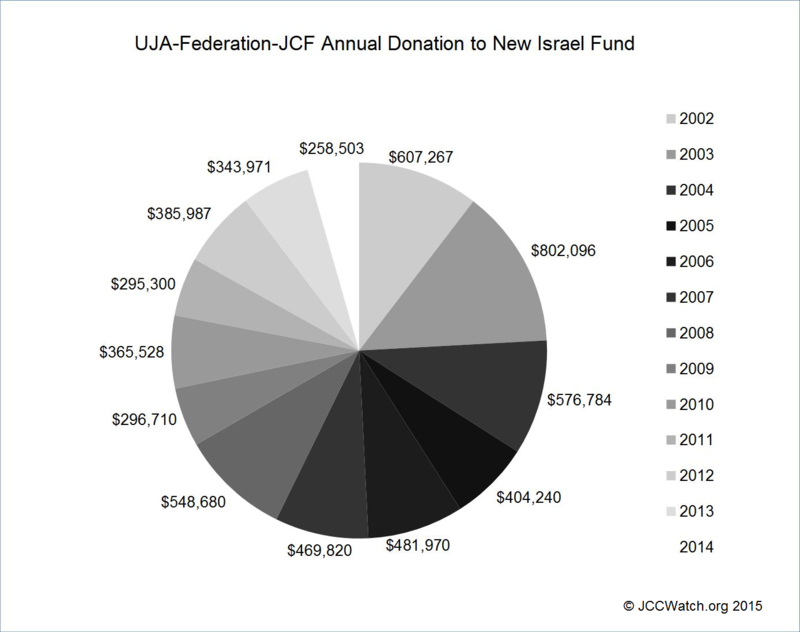 The following two illustrations show the cumulative and annual donations from UJA-Federation’s Jewish Communal Fund to the New Israel Fund since 2002. Call to Action: let JCCWatch know what you think about this report in the space below (LEAVE A REPLY), call the UJA-Federation (212-980-1000) to tell Alisa Doctoroff and Eric Goldstein what you think about this. And, please be sure to attend the Israel Day Parade on Sunday, tell New York that you support Israel and give a “Bronx cheer” to the boycott, divesting and sanctions-loving New Israel Fund devotees as they march by. Yasher koach, Richie. These people are despicable! When will these big shots ever learn?????? I’ll see you at the Parade! Richie, you knew it and you stuck to it! Kol HaKavod! So glad to be on this path with you! Great job! I stopped funding the UJA Federation years ago when I knew that they were funding and promoting the two state solution. This revelation of support for the New Israel Fund doesn’t surprise me at all. American Jews have been shifting radically to the left for some time, which is why they are in step with the Democratic party. Those who truly hold Jewish values are awakening to this reality. Unfortunately, the vast majority have adopted the values and religion of the left: secular humanism. They have a many friends in Israel who crafted the two state solution, and have worked with NGOS to deligitimise Israel. They want a nation like all others and do not believe in the justice of our right to a Jewish country guided by Jewish values. For more than twenty years they have succeeded in damaging Israel, and with every capitulation, we are no more accepted among the other nations. We must be true to our own faith. They have betrayed Israel and will also not help with this. It is sickening to read this. Non-stop anti-Israel propaganda is what the public is fed, and these traitors within (and at the top) of the tent combine to harm Israel – and all of the Jewish People. It is outrageous that money collected from those who support Israel is used to harm it. That’s a con game, and these self-decided “intellectuals” are guilty of fraud and they should be prosecuted. Oy gevalt. The Federation leadership should realize the Truth, apologize to the Jewish people. And then all resign. Great discovery! Thanks for delving into the mountain of bureaucracy and finding this important info.